Bangkok: Thailand’s prime minister said Bangkok was fighting the forces of nature on Thursday as residents fled, rivers swelled and floodwater threatened to burst through dikes protecting the capital. But Prime Minister Yingluck Shinawatra, a novice politician who only took office in August, told reporters the crisis had now reached a critical point for Bangkok. “It seems like we’re fighting against the forces of nature, massive floodwater that is causing damage to several of our dikes," she said. “What we can do now is to manage it, so that it flows slowly, otherwise everybody will suffer." As Yingluck’s voice started to tremble, reporters asked if she was crying. “No, I haven’t cried and I won’t. I’ll be strong to solve this problem for the Thai people. Right now we need to release floodwater to the sea as soon as possible and we need a quick rehabilitation plan," she said. Traffic in central Bangkok was light on the first day of a five-day holiday, declared by Yingluck’s government so people could leave. However, a main road out of the city to the flood-free south was jammed, with an exodus of cars to the seaside town of Hua Hin and the eastern resort city of Pattaya, where hotel rooms and homes to rent were hard to find. “We’re heading off to Hua Hin because people said it’ll be difficult, we should leave. If it gets worse, we won’t come back," resident Pornchai Tangsuwongthai told Reuters TV. Bangkok, a city of at least 12 million people that accounts for 41% of GDP, is in danger from run-off water from the north coinciding with high tides on the Chao Phraya river, which is already at a record high level in places. Bangkok governor Sukhumbhand Paribatra, who has said many parts of the capital could be in danger by the weekend, said not all of the city would be hit. “As the person in charge of Bangkok, I believe that the water will not flood every district. Some districts might not be inundated," he told reporters. Sukhumbhand’s comments have often contradicted those of Yingluck and have exposed rifts between the government and city authorities led by the opposition Democrat Party. TV showed crowded domestic check-in counters at Bangkok’s main Suvarnabhumi airport. Don Muang, the city’s old airport now used mainly by budget carriers for internal flights, had to close on Tuesday and services switched to Suvarnabhumi. At least seven huge industrial estates have also had to close to the north of Bangkok. The central bank has revised its growth forecast for Southeast Asia’s second-biggest economy to 3.1% this year from 4% as a result. The finance minister’s projection is a gloomier 2%. Deputy Prime Minister Kittirat Na-Ranong said on Thursday he expected job losses of no more than 10% of those employed in the shuttered industrial zones and there would be plenty of work when recovery efforts start. “The government still need hundreds of thousands of workers for reconstruction," Kittirat told reporters. The defence ministry said 50,000 armed forces personnel were standing by with 1,000 boats and 1,000 vehicles to help evacuate people. Authorities said Sai Mai, a third district in the city’s north, was in danger and residents should evacuate. The government crisis centre said there would soon be evacuation centres in eight provinces that could take in between 100,000 and 200,000 people. Late on Wednesday, the governor warned that dikes might not hold and the city could be swamped. 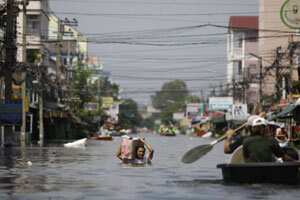 Yingluck has said floodwater could remain in the capital for up to a month. Banks and financial markets will operate normally during the holiday from Thursday to Monday, although flooding has forced 373 branches to close, including 86 in Bangkok. The stock market was up 2.3% at the close. Recently it has reacted more to changing views on Europe’s debt crisis than to the floods, although banks have tended to fall while drinking water and building material firms have climbed. Bangkok residents have stocked up on food, and items such as instant noodles and even rice are now in short supply, with bottled water nowhere to be seen. Some shops have restricted customers to small quantities to prevent hoarding while many vendors who supply food to locals and office workers were scarce in some districts. Workers were busy bailing out water from the grounds of the Grand Palace and the glittering Wat Pho temple, which are famous city landmarks. China urged its citizens not to go to Bangkok and told tourists “in the disaster zone" to leave immediately. Britain warned against all but essential travel in affected areas. Tourists intrepid enough to brave the floods may also have to contend with crocodiles. Thailand is reckoned to be the world’s biggest breeder of crocodiles and scores are reported to have escaped from farms during the floods. Several have been killed or captured in residential areas in the ancient capital of Ayutthaya.